Chinaese LED encapsulation market grew 19% Year-on-Year (YoY) to US $8.6 billion in 2014, according to 2015 Global Sapphire and LED Chip Market Report. The LED lights market has been the major growth factor for the industry, as the LED commercial lighting and residential lighting market penetration rates soar, it has continued to stimulate market growth. As LED encapsulation market demands increase, different LED encapsulation types have become standardized. For lighting applications, mainstream low to mid-power LED products include polyamide (PPA) or polycyclohexylene-dimethylene terephthalates (PCT), said Vincent Wu, Senior Market Manager, China, Osram. As for mid to high power LED lights, most encapsulation types have been traditional high power ceramic LEDs or Chip On Board (COB). Observations from Wu were backed by Jingyi Chen of Lightning, who also agreed most industry insiders accepted current LED chip sizes. In the future, LED encapsulation will be used as a standardized component, and no new specification will be added, said Wu. Manufacturers will be increasingly focused on improving LED chip features. At the moment, 2835 LED has been the primary LED package products on the market for small and mid-power LED applications, other mainstream encapsulation types include 3030, 5050 and 7070 EMC LEDs, as well as COB products. Although, Chip Scale Package (CSP) products are very popular on the market, it is not a mainstream product. These three product types have been the most popular on the market, and it will be worth exploring whether they will become the standard encapsulation sizes in the future. Will the high C/P ratio 2835 LED be replaced by 2016 LED? If we look at LED encapsulation development history, there are many different types of LED, serial numbers, and encapsulation methods. Only a small portion of the developments is aimed at meeting market demands, the main purpose of manufacturers in developing these products is use new product types to avoid fierce market competition. All these factors combined have contributed to rapid developments throughout the LED supply chain, which has created the impression that the industry is constantly changing. Rapid changes have lowered people sense of security. Under these conditions, the high C/P ratio 2835 LED emerged on the market. Although, the 2835 LED is the result of years of research and development by many manufacturers, that turned it into a standard component in the LED industry. However, in the encapsulation industry where C/P ratio is the only factor that matters, optimization of C/P ratio keeps going. Without making further technology improvements, 2835 LEDs market position will drop. To maintain its leading market position, 2835 LEDs must be able to further raise C/P ratio. 2835 LED prices has fallen the most among LED encapsulated products, and has climed from 10% to 17% during second quarter this year, according to some latest statistics. Mainstream 0.5W LED prices have even plunged 17%, indicating the market price wars are enhancing. Plunging 2835 LED prices also mean manufacturers will continue to pursue higher C/P ratio products. In the future LED encapsulation products will be increasingly standardized. So, LED encapsulation products will need to be compatible with other products, pragmatic and flexible. With more LED modules and strengthening, standardized LED lights components will become the major development trend in the future. Most LED encapsulation manufacturers have been focusing in the development of 2835 LEDs for a long time. From their point of view, 2835 LEDs have been the "preferred" asset of companies because of its maturing technology, manufacturing technology, and obvious pricing advantages. "You can say the 2835 LED is a revolutionary product in the LED light industry," said Yushen Liu, Executive Vice President, Hongliopto. The LED light market has a large demand for 2835 LEDs, and it is also Everlight best-selling high volume LED encapsulation product, said Everlight Spokesman Liu Pang-yen. Everlight has taken a step further in improving 2835 LEDs, and released the 2016 LED. To reduce 2835 LED encapsulation size, the company has fully used its advantages in wide beam angle, and reduced LED usage volume to control LED tube costs. 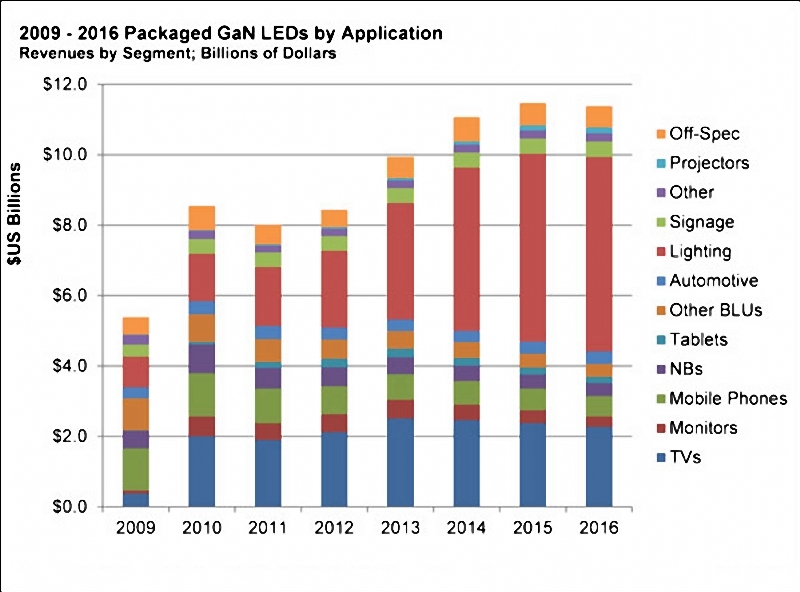 Will 2016 LED replace 2835 LEDs to become the mainstream LED package product in the future? Only time can tell. Large LED manufacturers including Lumileds, Everlight, Lightning, Hongliopto and other major Chinese LED package manufacturers have all launched 2016 LEDs, so it is still difficult to determine its future market position. It is for the market to decide whether this new LED specification will become the next standard LED encapsulation size, or eventually be withdrawn from the market. It is difficult to discuss 3030 LED without mentioning EMC. The 3030 LED is the representative of EMC products, and although its sales volumes are lower than 2835 LED, it is still one of the leading encapsulation types in the industry. The LED encapsulation industry has been driven by new materials, technology, and is developing at a rapid pace. Taiwanese and Chinese LED encapsulation manufacturers have all been actively expanding and deploying EMC market strategies. The 3030 LED has been the most successfully developed product among all LED light source types. The 3030 LED could be seen nearly everywhere at the Guangzhou International Lighting Exhibition (GILE) 2015, which took place in June this year in Guangzhou, China. Manufacturers that have invested in 3030 LED chips include Refond, Smalite, Hongliopto, Lightning, Everlight, Osram, and Seoul Semiconductor. Despite the vast interest in 3030 LEDs, market demands have lessened, according to latest statistics by some professional organization. Factors contributing to 3030 LEDs slow market performance included higher lighting inventory levels in 4Q14, which caused mid power LED prices to drop quickly. Price falls in 3030 LEDs were more serious as a result, with prices down 16%. Prices have continued to decline for high power 1W 3030 LED, which downed 9% during second quarter of 2015. In comparison, other product prices fluctuations have been less unstable. To further use EMC advantages, leading LED encapsulation manufacturer Everlight has built upon its 3030 LED foundation, and optimized the product C/P ratio to develop 5050, 7070 and 9595 LED series to compete with low wattage COB. At GILE 2015, it can be observed many other manufacturers shared similar strategies as Everlight, such as Lightning and Smalight. With more LED manufacturers have launch low power EMC COB products, will COB products only be appearing in high power LED products in the future? In recent years, COB has become a hotly talking market for LED encapsulation manufacturers. International factories are all competing to develop high quality, and high luminous efficacy COB products to stay ahead of Chinese LED manufacturers, and grab larger market share. These manufacturers have all expanded their COB product line, and have been focused on developing high quality, high efficacy, and high C/P ratio products. Besides, midstream and upstream LED companies are offering customized services and solutions to its LED manufacturers. As COB commercial lighting market advantages becomes increasingly evident, mainstream lighting solutions have become the main symbol in the LED encapsulation market. However, fierce market competition will also cause price wars. According to industry insiders, after last year extensive price cuts, COB market pricing will become more reasonable in 2015, and believe COB prices are reaching a stable price point. However, there might be further price fluctuations in the future. Recently, Crescent LED has turned to large scale automated production to reduce personnel and manufacturing costs. As a result the company product average selling price was down RMB 0.05-0.1 (US $0.01-0.2)/W. There are always many factors that contribute to market improvements. Many LED encapsulation manufacturers have released low power COB and EMC products at GILE 2015, which will certainly put pressure on COB suppliers.